First up, “The Making of Broncho Billy” (1913). The DVD I bought has a nice brief introduction to the star, reminding us that he was born “Max Aronson,” a Jewish man from Arkansas, and that he finagled a job as “Max Anderson” on “The Great Train Robbery” working for Edwin S. Porter. Supposedly, his horse threw him and he never was in any of the chase scenes, since he couldn’t ride. After founding Essanay, his own production company, with George K. Spoor, he went on to make over 350 films, mostly Westerns. Anyway, this film is a kind of “origin story” for Broncho Billy, although of course there had been many movies made before it. 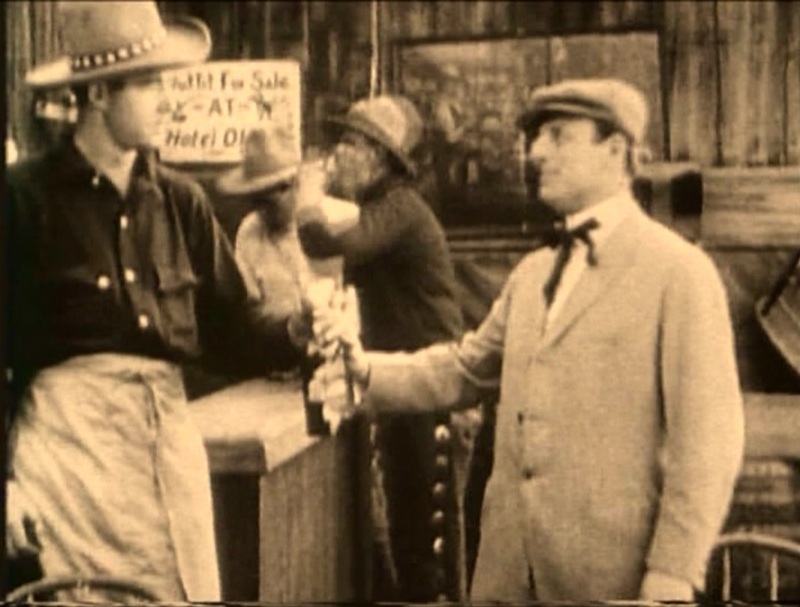 Anderson shows up in a Western town wearing Eastern clothes (he looks sort of like a young D.W. Griffith) and is mercilessly mocked by the local cowhands. When he tries to fight one in a bar, he learns that he must learn to shoot to gain their respect. We see him attempt shooting a bottle in his Eastern garb, but he can’t hit the side of a barn until he puts on a Stetson hat and cowboy shirt. After he confronts one of the bullies, he rides to the sheriff for protection as an angry mob comes after him, but the surviving bully just wants to shake his hand. Anderson is good in this, changing his body language and his acting style as he goes from the victim to the tough guy. 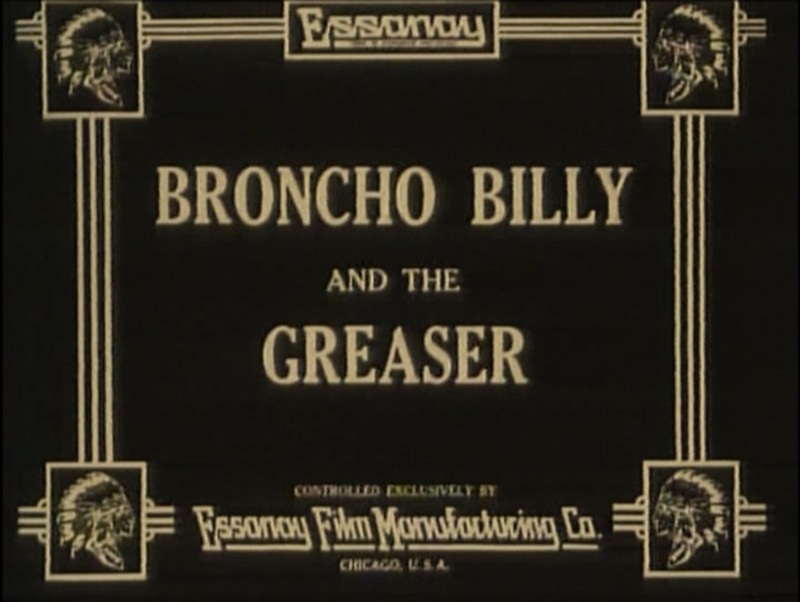 Next is “Broncho Billy and the Greaser” (1914). Westerns of this period are not at all shy about the explicit racial coding of their villains, and this is no exception – although the “half-breed” as the intertitles call the eponymous character, is apparently a white man in darkened skin. Anderson here gets an opportunity to display his “aw, shucks” style with women as well as his toughness with men, however, in the form of a love interest played by Marguerite Clayton. He saves her, and she rides to get a posse to save him when the half-breed sucker-punches him later in the film. Anderson plays a pony express rider, and much of the film’s action centers around an idealized general store/post office. We do see Anderson ride his own horse in this one. 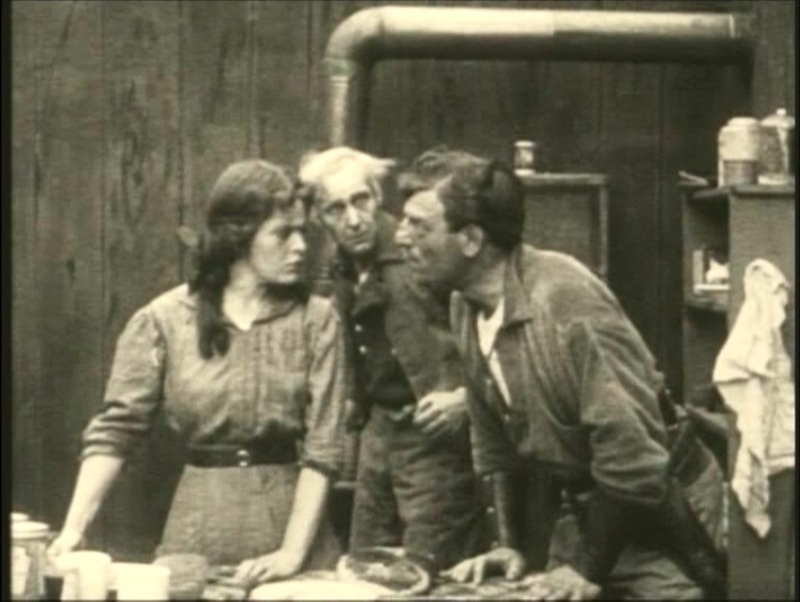 The third movie is “Broncho Billy’s Sentence” (1915). Billy doesn’t get along as well with the girl in this one. At the beginning of the movie, he’s a hunted fugitive, with ill-gotten money on his person. He hides out at the home of a young woman and her father, and while he’s there holding them at gunpoint, he decides to force her to kiss him as well. She, outraged by his taking advantage of her honor, pursues him with a shotgun and manages to wound him in the darkness. Now, he seeks shelter with a local pastor, and it is here that we see him begin to truly act. He comes slowly out of his shell as the pastor and his wife minister to his physical and spiritual wounds. When he listens in on a sermon from hiding, he finally decides to make it right, and goes to the sheriff, this time to turn himself in. Anderson gives a wonderful little ironic smile when the sheriff reacts to his effort to turn over his gun – for a moment it looks like he will be shot. But, he isn’t, and now we see him in a third stage in character progression. In prison, he has become the leader of the Sunday prayer group, and now he is the one preaching. The warden interrupts his sermon to let him know that his release has come, and Anderson proudly shakes his hand, asking only to be allowed to keep the Bible he has carried with him during his years of imprisonment. Why does the Queen of the Nile need a wristwatch? Next I watched “His Regeneration” (1915) again. I was very aware of how brief Chaplin’s cameo is this time, but what I also noticed is that, where this is also a movie about a man redeeming himself from a life of crime, Anderson’s performance changes very little of the duration of the movie, especially compared to “Broncho Billy’s Sentence.” Here, he is a small-time urban hood who meets a young woman (Marguerite Clayton again) from a higher social class at a dance hall (the balcony is for wealthy urbanites who want to go slumming while observing the hoi polloi at a safe distance). Later, he and his partner break into a rich house which turns out to be hers, and he fights him to convince him not to rob her. The partner is accidentally killed when his gun goes off, but the girl covers for him when the police arrive, and he promises to “make good.” Whether he does or not, his body language and wise-guy facial expressions remain pretty much the same throughout, without the clearer transformation he showed in the earlier film. The final movie is “Naked Hands.” The question with this one is whether it is a Century Film or not. It was released in two reels, evidently, in 1918, but the DVD cover seems to feel it was edited down from a 1916 feature-length film that no longer survives. For the sake of completeness, I’ll assume that to be the case and include it. It is easily the best of the movies listed here, even if this is a truncated version. Billy and his sweetheart Edith live in the lonely but beautiful hills of Montana when a city slicker comes to town. He convinces Billy to go out into the hills and search for gold, but it is a ruse to get Edith alone and convince her to run back to town and become his mistress. The joke is on them when Billy does strike gold! The local cowhands want to set up a necktie party, but Billy burns down the shack they shared and tells Edith to go her way – but if any harm comes to her, he vows to kill the city man “with his naked hands.” Years later, Billy is a rich gold mine owner, and Edith lives in relative neglect – her paramour had a family, as it turns out, and only wanted her for short-term amusement. Edith commits suicide, but manages to arrange it so that Billy will show up at the hospital in time to see her die. Now Billy goes for revenge, but his hand is stayed at the last moment when the man’s tiny daughter comes into the room and begs him not to hurt her daddy. Billy shows the whole range of emotions in this one, and looks just as comfortable in a tuxedo as he does in his rancher’s gear. The final fight scene also shows off a number of excellent stunts and the Montana sequences take beautiful advantage of the countryside. Even indoor shots are set up so that we can see the rolling hills just outside the doors and windows. So, there we have it, a binge-watch of the first major Western star. Even over this short time, I could see development from the relatively simple Western plots of the first two films towards movies that emphasize character growth and moral consequences. Many of the movies include some deliberate comedy relief, to lighten tensions, although of course none is quite so funny as Charlie Chaplin’s brief appearance in “His Regeneration.” After 1916, when Chaplin left the Essanay company to seek more money and greater control over his work, the Essanay company rapidly declined and Anderson returned to the stage for a time before becoming (mostly) a character actor in Westerns with new stars. I hope later this year to get hold of some of the work of William S. Hart, the man who largely replaced Anderson as the number one Western star in America, but for now, you can check out the other posts in the Marathon Stars Blogathon! 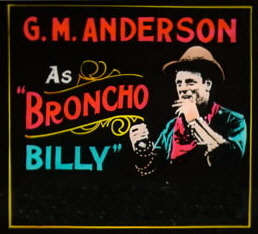 Where can I buy the DVD “The Making of Billy Broncho”? My relative, Brinsley Shaw is in the movie and I would love to see it. I won’t lie, the quality is middling, duped from an analog video made off a 16mm original. “The Silent Era” lists an Alpha Video release which is newer and possibly better, but I haven’t seen that one. 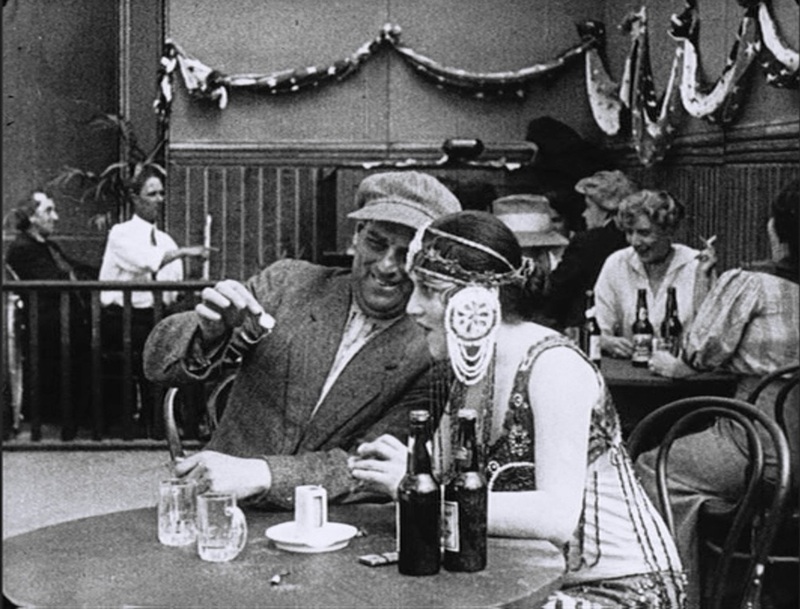 Alpha isn’t known for putting out the highest quality either, but the reviewer at “Silent Era” says that one “has likely been mastered from a 16mm reduction print.” Possibly better? Hard to be sure. Wow, I think I’ve never seen any of his films! I really, really need to fix this horrible fault! At least now I have this guide with where I should start! Thank you, it was a great post. I don’t think I’ve seen any of his films, but will aim to do so. 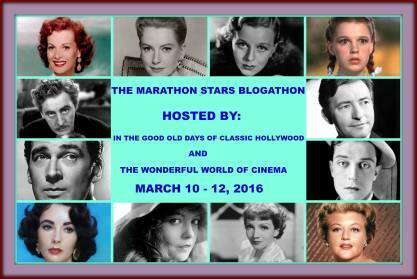 An interesting choice for the blogathon, and nice to see a silent star getting the spotlight. Thank you for hosting as well! It was a good chance for me to get to someone I’d been neglecting. I really love discovering new actors, so I’ll certainly have to see some of his films!